Central venous catheters (CVCs) contribute disproportionately to bloodstream infection (BSI) and, by extension, to infection-related hospitalization, mortality, and health care costs in patients undergoing dialysis. Recent product advancements may reduce BSIs, but a sufficiently powered comparative-effectiveness study is needed to facilitate evidence-based patient care decisions. In a 13-month, prospective, cluster-randomized, open-label trial, we compared BSI rates in facilities using ClearGuard HD antimicrobial barrier caps (ClearGuard group) with those in facilities using Tego hemodialysis connectors plus Curos disinfecting caps (Tego+Curos group). Forty DaVita dialysis facilities in the United States were pair-matched by BSI rate, number of patients using CVCs, and geographic location, and then cluster randomized 1:1. We enrolled all adult patients undergoing dialysis with CVCs at these facilities, except those allergic to heparin or chlorhexidine. Overall, 1671 patients participated in the study, accruing >183,000 CVC-days. The study outcome was positive blood culture (PBC) rate as an indicator of BSI rate. We calculated results at the cluster level and adjusted for the facility cluster effect. During a 3-month run-in period immediately before study interventions, the groups had similar BSI rates (P=0.8). During the 13-month intervention period that immediately followed, the ClearGuard group had a BSI rate significantly lower than that of the Tego+Curos group (0.28 versus 0.75 PBCs per 1000 CVC-days, respectively; P=0.001). No device-related adverse events were reported. In conclusion, compared with Tego connectors plus Curos caps, ClearGuard HD antimicrobial barrier caps significantly lowered the rate of catheter-related BSIs in patients undergoing hemodialysis using CVCs, representing an important advancement in hemodialysis patient care. Central venous catheters (CVCs) are used in only 19% of dialysis procedures in the United States, but are responsible for 70% of vascular access–related bloodstream infections (BSIs).1 In addition, BSI is the second leading cause of death among patients undergoing hemodialysis who use CVCs for their vascular access. Devices are now available that may significantly reduce BSI rates. However, comparative effectiveness data for these devices have not been available to allow evidence-based patient care decisions. This randomized comparative-effectiveness study evaluated two interventions designed to mitigate the risk of catheter-related BSI: ClearGuard HD Antimicrobial Barrier Cap (Pursuit Vascular, Inc.), versus the combination of Tego Needlefree Hemodialysis Connector (ICU Medical, Inc.) used in combination with Curos Disinfecting Cap for Tego (3M Healthcare). These devices are hereinafter referred to as the ClearGuard, Tego, and Curos, respectively. ClearGuard is a single-piece design that applies antimicrobial inside and outside the CVC hub versus Tego+Curos, which is a two-piece design that applies antimicrobial only to the outside of the Tego. Tego is designed to prevent bacteria from getting inside the CVC using a mostly “closed” system.6 Tego was previously evaluated in a retrospective study, which concluded that Tego may reduce the risk of CRBSI.7 For additional protection, Curos is used with Tego. Curos kills organisms on the outside surface of Tego using 70% isopropanol alcohol. Curos was previously shown in vitro to kill infection-causing organisms.8,9 The combination of Tego+Curos was used in this study because it is expected to perform better than Tego alone. ClearGuard is designed to kill bacteria inside and outside the catheter hub, whereas Tego+Curos kills bacteria on the outside only. Forty dialysis facilities were enrolled in the study, with 20 in the ClearGuard group and 20 in the Tego+Curos group. All facilities remained in the study throughout its duration. All patients with CVCs dialyzing in participating facilities were enrolled in the study with the exception of nine who were excluded due to history of heparin allergy (none were excluded for chlorhexidine allergy). A flow diagram for enrollment is shown in Figure 2. There were no protocol deviations or device-related adverse events reported during the study. There was one protocol change to increase the intervention period from 12 to 13 months. Flow of subjects through the study. (A) Run-in and (B) intervention periods. A total of 627 patients (304 ClearGuard, 323 Tego+Curos) qualified for primary analysis of the run-in phase of the study. Characteristics of participants in the two study groups (Table 2) were reasonably balanced, with the exception of race (35% versus 46% black, respectively; omnibus P=0.02) and diabetes (55% versus 64%, respectively; P=0.02). A total of 1671 patients (826 ClearGuard, 845 Tego+Curos) qualified for primary analysis of the intervention phase of the study. Again, characteristics of participants were reasonably balanced (Table 2) with the exception of age (63.7 versus 62.0 years, respectively; P=0.02) and race (32% versus 42% black, respectively; omnibus P<0.001). During the 3-month run-in period, 18 positive blood cultures (PBCs) occurred during 18,739 CVC-days in the ClearGuard group, and 22 PBCs occurred during 20,454 CVC-days in the Tego+Curos group, corresponding to rates of 1.02 and 1.08 per 1000 CVC-days, respectively. Between-group differences in rates were nonsignificant (P=0.8). During the 13-month intervention period, 23 PBCs occurred during 83,064 CVC-days in the ClearGuard group, and 75 PBCs occurred during 100,042 CVC-days in the Tego+Curos group, corresponding to rates of 0.28 and 0.75 PBCs per 1000 CVC-days, respectively. Twenty-one and 63 unique patients experienced PBCs, respectively. The incidence rate ratio (IRR) was 0.37 (P=0.001) favoring ClearGuard (Figure 3A, Table 3). Study results demonstrate that ClearGuard caps are superior to Tego+Curos for reducing bloodstream infection across all nine analyses. 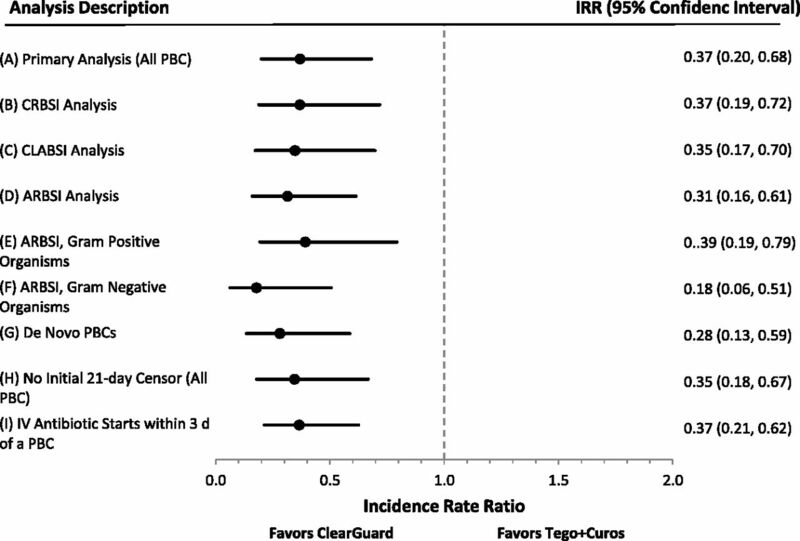 Summary of IRRs (dots) and 95% confidence intervals (whiskers), ClearGuard facilities versus Tego+Curos facilities, for (A) primary analysis and (B–I) exploratory sensitivity analyses. Estimates<1 favor ClearGuard. The term CRBSI, as used in the literature, ranges from surveillance definitions (all PBCs occurring in patients with CVCs) to rigorous clinical definitions (defined by precise laboratory findings identifying the CVC as the source of the infection).10,11 In this study, the link between the PBC and a true CVC-related BSI is as follows. The analysis, CRBSI is defined as: (1) analysis is performed on a per-patient basis (maximum of one PBC per patient) to ensure no duplicate counting of the same infection; (2) to better ensure that PBCs were related to the CVC, only PBCs designated as access-related on the National Healthcare Safety Network (NHSN) forms of patients with CVCs were included; (3) to help rule out skin contamination, only PBCs with recognized pathogens (no common commensals) were included; and (4) PBCs with polymicrobial growth were excluded because this may be an indication of contamination. The denominator is the number of days at-risk per study protocol. The resulting IRR was 0.37 (P=0.003) favoring ClearGuard (Figure 3B, Table 3). The central line–associated bloodstream infections (CLABSI) analysis was on the basis of the NHSN CLABSI definition.12 In this analysis, the PBC (numerator) must either be (1) a recognized pathogen and not related to an infection at another site, or (2) a common commensal from two blood draws, not related to an infection at another site, and patient has at least one of: fever, chills, or hypotension. The denominator is the number of days at-risk per study protocol. The resulting IRR was 0.35 (P=0.003) favoring ClearGuard (Figure 3C, Table 3). The access-related bloodstream infections (ARBSI) analysis was on the basis of the Center for Disease Control (CDC) NHSN definition for ARBSI.13 The numerator is PBCs with the suspected source reported as the vascular access or uncertain. The denominator is the number of days at-risk per study protocol. The resulting IRR was 0.32 (P<0.001) favoring ClearGuard (Figure 3D, Table 3). ARBSI events were analyzed according to organism type. When considering only ARBSIs comprising Gram-positive organisms, the IRR was 0.40 (P=0.01) favoring ClearGuard (Figure 3E, Table 3). For ARBSIs comprising only Gram-negative organisms, the IRR was 0.19 (P=0.001) favoring ClearGuard (Figure 3F, Table 3). There were too few fungi PBCs to perform an analysis (no events in the ClearGuard group). The IRR for multidrug resistant organisms was 0.60 (P=0.5); there were 4 PBCs in the ClearGuard group and 8 PBCs in the Tego+Curos group. To account for potential latent effects due to colonization of catheters before entering the study, a subgroup analysis was performed among patients entering the study with a new CVC (called de novo CVC); thus, all patients in this subgroup start with a CVC vintage of zero. The resulting IRR was 0.28 (P<0.001) favoring ClearGuard (Figure 3G, Table 3). Because of the biologic latency between CVC inoculation and eventual BSI, the primary analysis did not consider infections that occurred within 21 days of patient start (Figure 4), and thereby also excluded patients who had <21 CVC-days. To understand potential implications of this a priori analytic choice a sensitivity analysis was conducted in which all patients with CVCs were considered from their study start. The resulting IRR was 0.35 (P=0.002) favoring ClearGuard (Figure 3H, Table 3). Each patient's at-risk time is dependent on when the patient began and ended CVC use during the study period. An analysis was performed to investigate whether an increase in antibiotic use could be responsible for the decreased infection rates. The rate of intravenous (IV) antibiotic starts decreased by 0.6 per 1000 CVC-days from run-in period to intervention period, with the greatest decrease in the ClearGuard group. In addition, an analysis was performed to investigate whether there was a corresponding decrease in the rate of IV antibiotics associated with PBCs. The resulting IRR was 0.37 (P<0.001) favoring ClearGuard (Figure 3I, Table 3). Additional exploratory analyses were performed to observe trends in areas where the study was not designed to have sufficient power. CVC exchange rate was not statistically different in the ClearGuard group versus Tego+Curos (0.94 versus 1.03 per 1000 CVC-days, respectively; P=0.8). CVC removal rate was similar between the two groups (7.57 versus 7.56 events per 1000 CVC-days, respectively; P=0.9). Thrombolytic use rate was not significantly different between the two groups (1.84 versus 1.89 per 1000 CVC-days, respectively; P=0.9). Hospital admissions for BSI were analyzed using the dialysis facilities’ records of admission (no other hospital records were available); the rate of hospitalizations for BSI was lower in the ClearGuard group versus Tego+Curos (0.06 versus 0.11 per 1000 CVC-days, respectively), but the difference was not statistically significant (IRR=0.55; P=0.5). There were no deaths within 30 days of a PBC in the ClearGuard group, and three deaths in the Tego+Curos group; however, these results were statistically insignificant. Lock solutions were not required to be reported. However, they were recorded in 33% of all procedures. Within both groups, the vast majority (>95%) of procedures used saline as the lock solution. This study demonstrated that use of ClearGuard resulted in a significantly lower BSI rate versus use of Tego+Curos. During the 3-month run-in period, there was no statistical difference in PBC rates between the two groups. This suggests that groups were well balanced in terms of BSI risk and that differences in BSI rates seen during the intervention phase of the study can be more confidently ascribed to study interventions. The BSI rates were lower during intervention period versus run-in period in both groups, which is expected because ClearGuard and Curos are both designed to reduce BSI rates. This study’s primary analysis, along with the exploratory analyses, demonstrated that in a real-world hemodialysis setting use of ClearGuard was superior to use of Tego+Curos at reducing PBCs, CRBSI, CLABSI, Gram-positive infections, Gram-negative infections, and IV antibiotic starts related to PBCs in patients undergoing hemodialysis using CVCs. 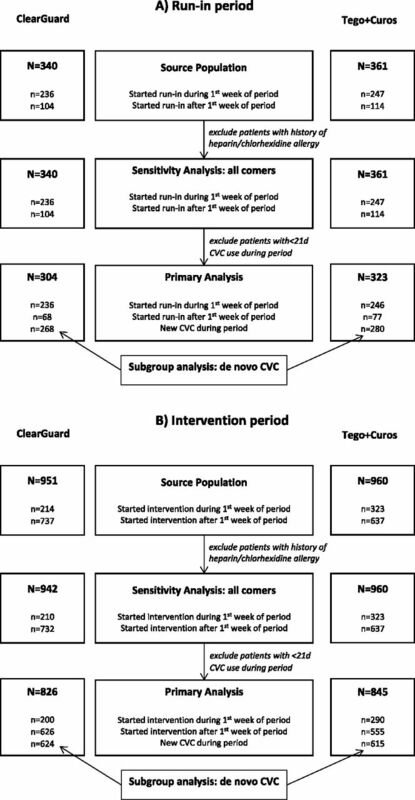 A de novo subgroup analysis considered comparative effects of the study interventions in the context of newly placed CVCs. Such a scenario may be a better indicator of the effects of interventions if each were adopted as standard of care (i.e., whereby over time all CVCs would be treated with the ascribed intervention from the outset). Although the effects in this subgroup cannot be formally compared with the effects of the primary analysis, it is reassuring that effects were at least as great and, in fact, numerically more potent (IRR=0.28; P<0.001). In the primary analysis, at-risk time began 21-days after first receipt of study intervention. This choice was prespecified and was adopted to account for biologic latency of infections particularly in the setting of preexisting CVCs. Nonetheless, it is reassuring that the comparative benefit of ClearGuard was at least as great (IRR=0.35; P=0.002) in a sensitivity analysis in which the 21-day lagged start of at-risk time was not used and all patients were considered from the first date of study intervention. The study results are likely broadly generalizable to United States dialysis facilities because (1) this study was conducted in a real-world manner with broad inclusionary requirements, (2) the control group was formidable (Tego+Curos using best-practice infection prevention techniques), (3) the ClearGuard performance is consistent with an independent study conducted at another large dialysis provider using a different control group,5 and (4) the primary results are consistent with the exploratory analyses which scrutinized potential contamination, sources of infection, and censoring effects. Our findings demonstrate that ClearGuard caps are statistically superior to Tego+Curos for reducing CRBSI, representing an important advancement in improved patient care. This was a prospective, cluster-randomized comparative effectiveness trial of ClearGuard versus Tego+Curos among patients dialyzing with CVCs. The study was conducted at 40 dialysis facilities. All facilities had previously used Tego before inclusion in the study. Also, all facilities had indicated willingness to adhere to treatment allocation upon eventual randomization and all underwent a 30-minute training session describing procedures necessary to both study arms. These 40 facilities were pair matched on the basis of: (1) prestudy BSI rate, as reported to the CDC NHSN from February to July of 2015; (2) the number of patients with a CVC; and (3) geographic location. Within each matched pair, one facility was randomly allocated to ClearGuard and the other to Tego+Curos using a computer-generated algorithm. The unit of randomization was the facility and all eligible patients within the study were treated according to the corresponding intervention. Eligible patients were those who dialyzed using a CVC. Beyond this, exclusions were made only for known hypersensitivity to heparin (nine patients) or to chlorhexidine (none). The study was approved by New England Independent Review Board (IRB# 15–281), which also granted a patient informed consent waiver. The informed consent waiver was important for conducting the study in a pragmatic manner, adherence to the prescribed intervention, and broad inclusion. Upon randomization, facilities entered into a 3-month run-in phase. During this phase both study arms were treated according to facility standard policy (including use of Tego). The purpose of this period was to assess whether BSI rates were equivalent between study arms before institution of study interventions. After the run-in period, facilities entered a 13-month intervention phase. During this phase, patients in the Tego+Curos group began including Curos (and continued using Tego). Patients in the ClearGuard group converted from Tego to ClearGuard. Patients with a CVC received the facility’s assigned intervention at their first dialysis session after the study start date, and new patients with CVCs coming into the facility were added as appropriate throughout the study. In the Tego+Curos group, Curos was replaced each session and Tego was replaced once per week according to existing facility protocols. In the ClearGuard group, ClearGuard caps were replaced each session. Aside from CVC capping, all patients were treated according to local standard of care and existing physician orders. This included standard surveillance for potential BSI, which adhered to the NHSN guidelines. All blood cultures were sent to and processed by a single clinical lab (DaVita Labs, Deland, FL). As is standard policy, blood culture results were reported into the electronic health record in automated fashion, from which they were abstracted for analysis. The primary study outcome was blood culture positivity rate. This was calculated by dividing the cumulative number of PBCs (as defined according to NHSN guidelines) by CVC time at-risk (Figure 4). To avoid double-counting the same BSI, patients were censored using the CDC’s NHSN-recommended 21-day rule: a PBC is counted only if it occurred 21 days or more after a previously reported PBC in the same patient.26 To account for biologic latency between catheter seeding and clinical manifestation of BSI, at-risk time began on day 21 after first receipt of study intervention and continued until end of study, death, CVC removal, or loss to follow up; by extension, patients treated with a CVC for <21 days were excluded from analysis. In addition, multiple exploratory analyses were conducted using DaVita electronic records, which include microbiology, NHSN surveillance, and other records. The IRRs and the corresponding 95% confidence intervals for the final analysis were calculated using a Poisson regression model with a log link function and the natural logarithm of patient-days at risk as an offset and adjusted for the facility cluster effect, where each matched facility pair was considered a cluster. This study was supported by Pursuit Vascular Inc. S.M.B. is an employee of DaVita Clinical Research; D.B.V.W. and L.N. are employees of DaVita Inc.; L.E.L., D.P.K., and R.J.Z. are employees of Pursuit Vascular Inc. and may have patents, board membership, and/or stock ownership. Pursuit Vascular sponsored the study and thus paid DaVita Clinical Research, the clinical research organization of DaVita, for conducting the study. No additional financial relationships exist between DaVita and Pursuit Vascular. We extend our sincere appreciation to the teammates in >2000 DaVita clinics who work every day to take care of patients and also to ensure the extensive data collection on which our work is based. We thank all of the DaVita Clinical Research teammates who contributed to this work. We thank NAMSA (North American Science Associates Inc.) for performing the statistical analysis. An abstract of this study was published as a late-breaking clinical trial in the National Kidney Foundation Spring Clinical Meetings, Orlando, Florida, April 18–22, 2017. See related editorial, “Targeting Zero Infections in Dialysis: New Devices, Yes, but also Guidelines, Checklists, and a Culture of Safety,” on pages 1083–1084.